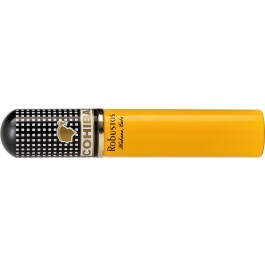 The Cohiba Robustos is a Cuban all-star, powerful and complex, 50 ring gauge, 4.9” (124mm) long and comes in 5 packs of 3 aluminum tubes. One of Habanos best sellers. Thanks to its near perfect construction and flavors, it is the benchmark for all other robustos. A must-try for any cigar aficionado. 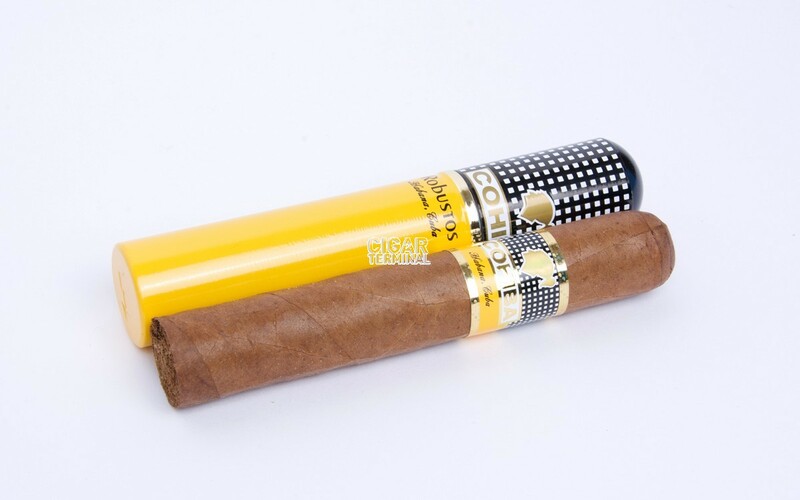 The Cohiba Robustos are unique because they have a great construction, with colorado claro wrapper, with almost no veins and an awesome foot. •	Many view this robusto to be the best in the world due to its richness, complexity and strength. It is a true masterpiece thanks to Cohiba’s unparalleled quality. •	Prepared with exquisite care, it has many common characters with his elder brother, the Esplendidos. •	Both a work of art and a delight to the palate. Very good burning with three well-defined parts, the first one with light flavors of grass and pepper, the second part with vanilla, and the third displays a strong tobacco flavor and chocolate tones with an undertone of barnyard. Like every Cohiba, the Robusto is a beautiful cigar. It has a light tan colored, oily wrapper, some very smooth veins and some wrinkles. The bunch is solid and the triple cap is flat and well applied. Strong aromas of earth and vanilla can be found on the foot of the cigar and the pre-light draw is perfect. A couple of puffs leave on your lips a subtle salty taste. Black honey notes are dominant, married to a delicate spiciness. A delicious pre-light draw. The ash is firm, dark grey in color, and reaches more than two inches in length before it falls of. The draw is perfect all the way through from foot to cap, delivering thick rich smoke, with the distinctive Cohiba creamy texture. The draw is great from the very start that is supple and ample. The delicate taste of black honey with hints of spiciness is dominant in the first third. The classic Cohiba characteristics of grassiness appear from the first draw. Medium to full bodied at the start, earthy and creamy flavors and a peppery finish. Into the second third, the cigar becomes more complex exhibiting wood, caramel, honey and cedar. Has plenty of earth and wood, all perfectly balanced in great harmony. In the last third the flavors get stronger and the body fuller. Notes of cocoa and leather are adding to its huge complexity. The Cohiba Robusto is simply delicious! In summary, consistent with great draw and burn, smokes for about 60 minutes growing in strength starting off medium ending beautifully with full creaminess and rich great strength with a clean aftertaste on the palate.